A late 18th century mahogany writing desk. Samuel Townsend carried this desk with him on his many business trips and until his untimely death in 1830. Many late 18th and early 19th century documents were preserved in this desk, and are now maintained in the Society's Archives. The Portraits, painted circa 1827, show Samuel and Rebecca (Purdy) Townsend, great-grandparents of the Townsend Society's benefactress, Helen Hart Townsend. About two years after these portraits were painted Samuel was lost at sea off Sandy Hook. A Powder Horn belonging to the Rev. Solomon Townsend and dating to the period of the French and Indian Wars (1754-1765). 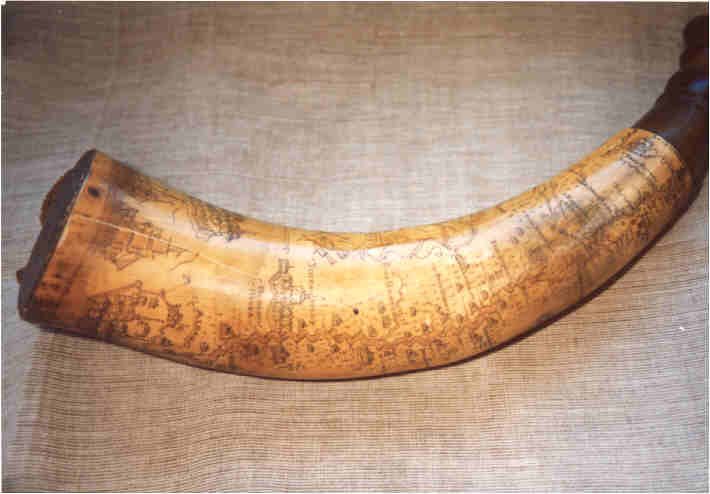 The powder horn is engraved with a pictorial map of the Hudson River showing the fortifications along the river. Solomon Townsend was the minister of the Barrington, Rhode Island Congregational Church for 54 years in the 18th century. Donated June 6, 1986 by Harry W. Townsend, Pocasset, MA. This item is not on display.